Where would you like your stage? Rear ramp or Side of Trailer? Do you want rails all around or an opening? Please describe. Perfect for a DJ set up, performance stage, auction stand,or for an open raised deck area. Your choice: Convert Rear Ramp (8.5 Wide Stage) into Stage with Jacks and Rails runs $2,750.00 - Photo shown is for a 12' Stage added to the side of the trailer for $4,125.00. 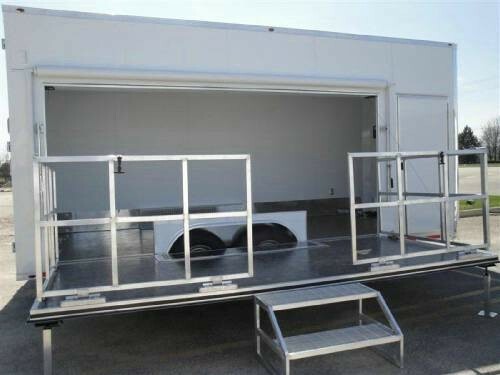 We also offer a 20' Wide Stage that can be added to the side of the trailer for $6,875.00. The stage option includes your choice of floor covering, rails, one gate, jack stands, and a winch and battery to raise and lower the stage. Stairs are not included. Please note 12' stage requires a minimum 16' trailer. The 20'stage requires a minimum 24' trailer.